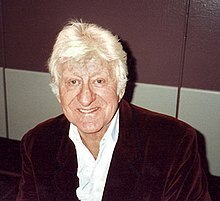 John Devon Roland Pertwee (7 July 1919 – 20 May 1996), better known as Jon Pertwee, was an English actor. He is best known for playing the role of the Third Doctor on Doctor Who from 1970 to 1974 and also the title scarecrow in the television children's comedy series Worzel Gummidge. His son is actor Sean Pertwee. He was a cousin of actor Bill Pertwee who played Chief Warden Hodges in the comedy Dad's Army. This page was last changed on 1 November 2018, at 18:53.